Folks in Waynesboro realize that there’s a jewel of a basketball team that plays up on the hill overlooking downtown, right? Um, well, no. I mean, Roy Williams knows. You know, the North Carolina basketball coach? Won a national championship or two? 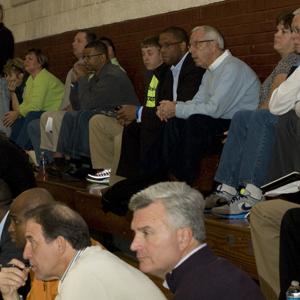 He was in the gym watching a game in the Best Western Waynesboro Caisson Shootout today. The new Virginia Tech hoops coach, James Johnson, he was there, too. Had practically his whole staff with him. My wife and I were sitting beside them for the first half of the nightcap of day one of the Shootout, a game pitting two national Top 10 teams, Hargrave Military and Kiski, and didn’t even notice them there. Maybe that’s because we were too busy, well, watching a good basketball game, and trying to keep up with the other celebrity sightings. Matt Brady, the JMU coach, was sitting behind us. Clemson had an assistant on hand to take tabs of the goings-on. And yes, there was good basketball. Four of the nation’s Top 10 prep basketball teams are in town for the weekend. Players being recruited by schools that you’re used to seeing regularly on national TV and playing deep into March Madness are here. There were many, many more coaches on hand today for the games than there were local fans. All I can say is, you’re not there, and Ol’ Roy is there. Had to drive up from Chapel Hill, what, about a four-hour drive? He had Hubert Davis to keep him company. Hubert, from the early 1990s Carolina teams, and most recently from ESPN? Seriously, if you like hoops, you need to get out to FMS this weekend. Actually, don’t. If you’re not there, I get the coaches to myself.